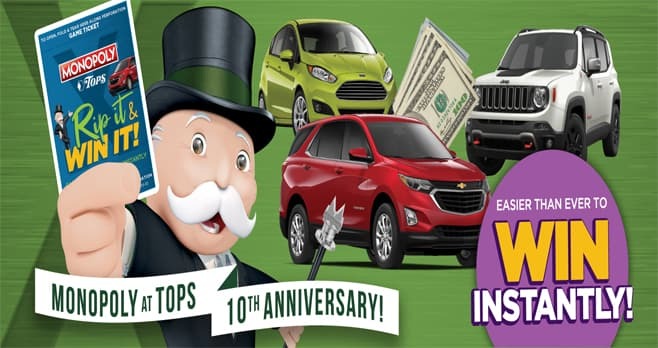 Tops Monopoly 2019: Play the Tops Monopoly Game 2019 at Tops Markets or online at topsmarkets.com/Monopoly and you could win big. Will you be lucky enough to find Tops Monopoly 2019 rare pieces? There’s only one way to find out. The Tops Monopoly 2019 is open only to legal residents of New York, Pennsylvania and Vermont, ages 18 and over. The Sweepstakes begins at 12:00:00 a.m. on March 17, 2019 EDT and ends at 11:59:59 p.m. EDT on June 8, 2019 or sooner if all Game Tickets are distributed before June 8, 2019. The grand prize consists of a $25,000 Car. Visit www.topsmarkets.com/Monopoly to enter and see Official Rules for details.